I’ve had quite a few requests for more information about the McIntosh EF-1080I amplifier (often but incorrectly referred to as the EF-10801). This unit is actually made by Clarion and is supplied as stock equipment with many Subaru Legacy and Outback cars manufactured between 1998-2003. The amplifier receives four balanced inputs from the head unit; front left and right, and rear left and right. It features a built-in low pass filter (also called a crossover) for the subwoofer. This low pass filter is set to a fixed roll-off frequency and gain, although I haven’t yet worked out exactly what the frequency is. The main channels then pass through a fixed 6-band equaliser that has been tuned to match the speakers and car interior. The front and rear equalisers are feature different configurations. All fives stages then each go to a TDA7295 power amplifier. The main speakers are all 8 Ohms and the subwoofer is 4 Ohms. 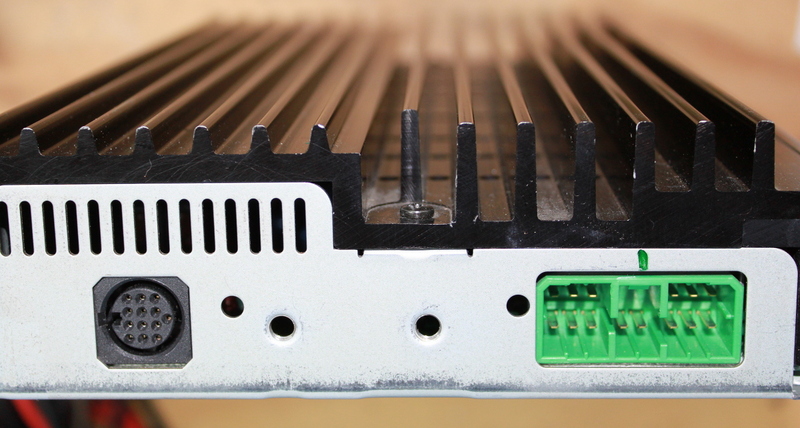 The power supply produces +/- 26V for the power amplifier stage and +/- 15V for all of the preamp stages. The amplifier is configured slightly different for sedans and wagons. Although they feature the same model number, they can be identified by the power connector. Amplifiers intended for a sedan have a green power connector; amplifiers for wagons have a white connector (see photos below). 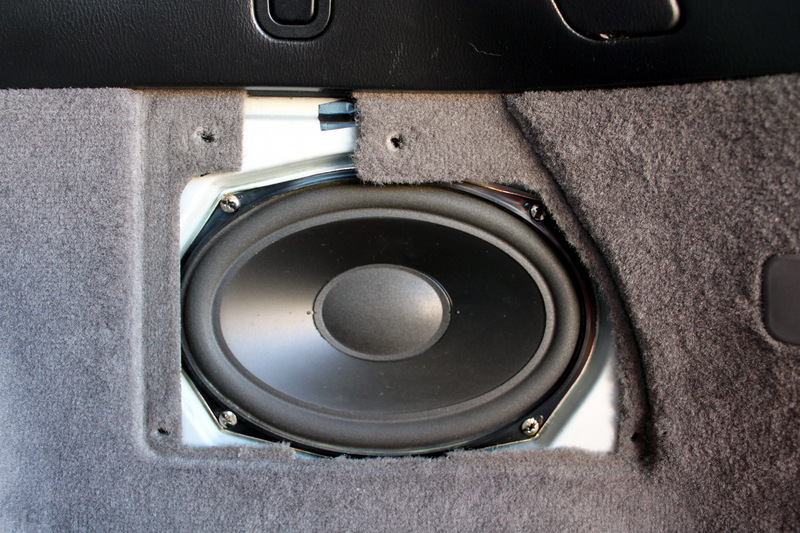 Inside I’ve noticed that the subwoofer gain is reduced in the sedan version but have yet to locate any other changes. If you have one of these amplifiers and wish to connect to it, here’s the details. Pinouts for the input connector. The colours simply refer to the original Subaru wiring. The input connector is a 13-pin DIN style and is available from electronics suppliers such as TradeTech and Digikey. You can connect the amplifier to any brand of stereo; simply use the ‘+’ inputs only and connect these to the line (not speaker!) outputs of your stereo. Connect the ‘-‘ inputs of the amp to ground to prevent any induced noise on the inputs. If you are installing your amp with a matching McIntosh head unit and do not have the official cable to connect them, you can fit the plugs to length of shielded Cat 5 (or better) cable instead, using one pair per channel. You will also need to run a separate wire for the amplifier power control. The power and speaker connector is a TE Connectivity (formerly AMP) Multilock 070 series 14 pin connector, part number 173852-1. This is the same type as used in Subaru head units from the early 1990s until around 2006 and it’s readily available from electronics wholesalers such as Element 14, Mouser and Digikey. The pins (part 173631-1) are sold separately to the housing so make sure you grab some of those too. Make sure you use both ground and power pins due to the high current drawn by the amplifier. Here’s the official service manual for this unit. It is very easy to change the subwoofer gain to get a bit more punch. See this post for more information. If your amplifier is dead it could quite likely be the 25A fuse. This is a standard automotive blade fuse but is soldered onto the main PCB making it a little more work to replace. One unit I came across appeared to be almost completely dead but was quite simple to fix. Read this post for details. If you do decide to open your EF-1080I, make sure you take note of where every screw goes! Installing them incorrectly risks shorting the amplifier chips to the chassis of the amplifier which will permanently destroy them (the chip’s mute pin ends up internally shorted to ground). Note the green power connector shows this unit came from a sedan. Wagon amplifiers have a white connector. Some high resolution photos of the inside. Click for the full size version. 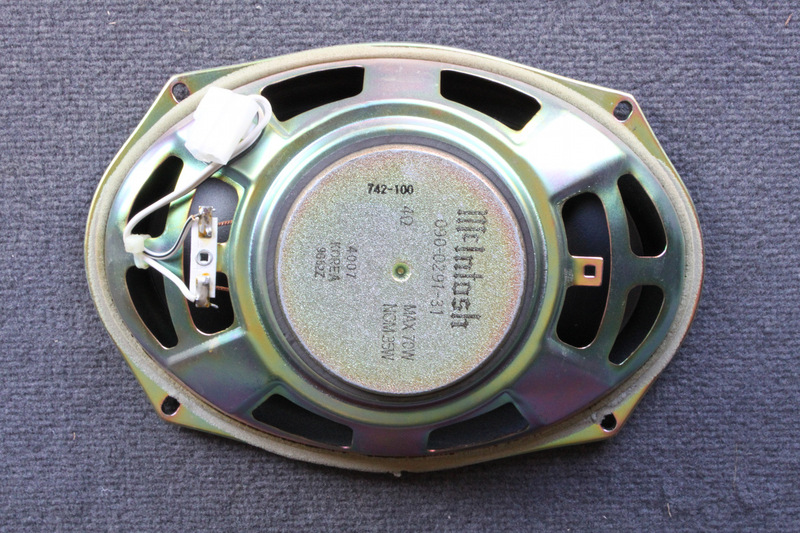 The subwoofer is a simple 6×9″ 4 Ohm polypropylene driver, part number 09-0291-31. In wagons it is fitted in the right wall of the boot (trunk) and in sedans it is on the left side of the rear shelf. ‘6-band equaliser that has been tuned to match the speakers and car interior’ which usless for normal sounding? then i might give up the EF-1080i..and head units!? The head units – PF-2142I Do you know on the power connector when they say illuminate if this is the 12 volt input. They have 12 V dimmer 12 V Antenna 12 V Accessory and 12 V illuminate. The Antenna and Accessory are outputs but I am not certain of the Dimmer and Illuminate. Just want to be sure andy input will be greatly apprecaited. (my unit came from New Zealand and I am not sure if they use the term Illuminate for 12 Vot input as to turn on like a light bulb. If there is only the Illum+ input, then yes it is 12v. If the radio has two Illum inputs (+ and -), Illum+ needs to be supplied 12v to turn on the backlights and Illum- should be permanently connected to ground if there is no connection for it in the vehicle. I’ve just acquired this power amp.Is it absolutely nexcessary that I use only the original 8 ohm speaker? can I use 4ohm of other brands? 8ohm car speakers are impossible to come by here in Malaysia. They probably will be fine but they might drown out the sub; you will need to increase the sub gain to compensate. There is a risk you might stress the PSU or blow the fuse if you turn it up too loud due to the increased current requirement though. Can you tell me do you know the pinout (location/output and colour) for the 14 pin auto connector on the back of the PF-21421. Im assumming this is the ouput to the AMP. Is that correct??. thanks for the prompt reply.I won’t take a chance.Contacted the seller and he’s still got the original speakers with him. He’s upped the price as he knows how much I want them.Will arrive by mail next week. Was disappointed though that the drivers are made in China and the sub in Korea.Was it always that way? The din cable will have to be modified though as I’m using the RCA out from the Pioneer player that I now have.Shame to have it cut up though. Those DIN cables are exceptionally hard to find (at least outside of Japan or NZ); you could probably sell it on eBay for a good price and make up your own quite cheaply with RCA connectors. I agree with you on the speakers; they are not spectacular but are certainly better quality than most OEM car speakers I have seen (e.g. polypropylene cones, etc). The speakers were all originally made in Korea (MY98-MY00 models) before production appeared to shift to China. Interestingly enough the Chinese built ones use a slightly different type of foam for the surround which seems to last longer than the older style. There are some other nice touches in the system too like a Burr-Brown DAC in the CD player and the EQ in the amp but I guess we have to bear in mind the system was still made to a budget and it’s really manufactured by Clarion. The speakers are quite cheap here in NZ if you talk to the right parts shops; you can sometimes pick them up for less than NZ$40 per pair. Just watch the condition of the surrounds; they are of the age now that many have worn so be prepared to repair them if necessary. I replaced the surrounds in mine with butyl rubber versions and they perform very well. The surround on one of my front speakers has gone out, giving me the rattles. Do you know the cutout and depth dimensions? I don’t want to disassemble my door panels any more times than absolutely necessary, I have a tendency to break clips. I’m planning on replacing the fronts with a new pair of separates, leave the rear doors stock, and put a secondary amplifier for an independent subwoofer (which should ease the current draw with the new 4-ohm load). If you have any tips tricks or ideas, let me know! Much appreciated! 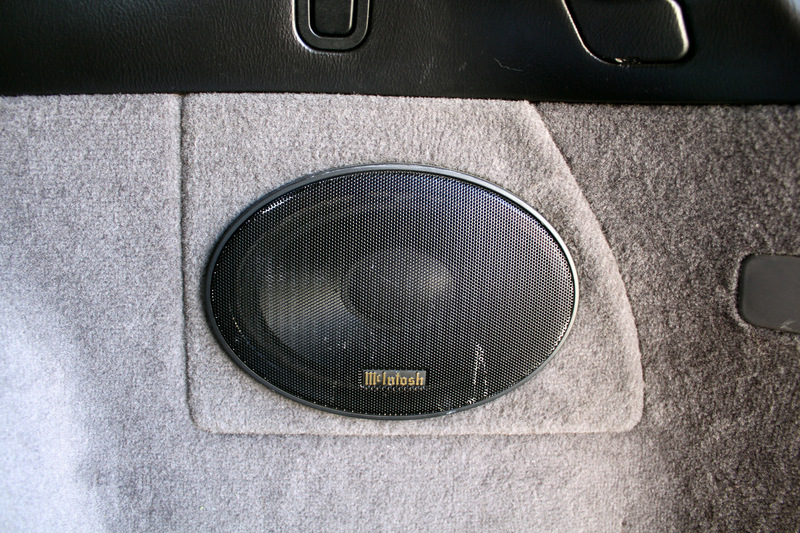 Any 6″ car speaker should do, provided it’s not too deep. Other than that I can’t see any issues except for the fact that the rear speakers will be a bit quieter than the front ones due to the different impedance. That said your rear speakers probably won’t last much longer if the front ones have already gone. I actually replaced the surround on my factory speakers with butyl rubber ones which last much longer. I’ll just have to wait till the courier man arrives to see the real condition of those speakers. The seller threw in the DIN cable for free though.Next, I’ll have to get the auto tech to correctly identify the pins on the cable(using the chart you’ve posted)and have them converted to RCA style for the Pioneer head unit. Are they any things we ought to watch out for during this process? I don’t quite understand how pins 5,6 & 12 work. Could you help explain? Bit of a novice when it comes to car electronics. The ground wires simply connect to the cable shield on each end. The remote cable switches the amp on when 12v is applied to it. This should be connected to the amp remote wire (blue/white) on your Pioneer unit so that the amp powers up when you turn the stereo on. will keep you posted of my progress. 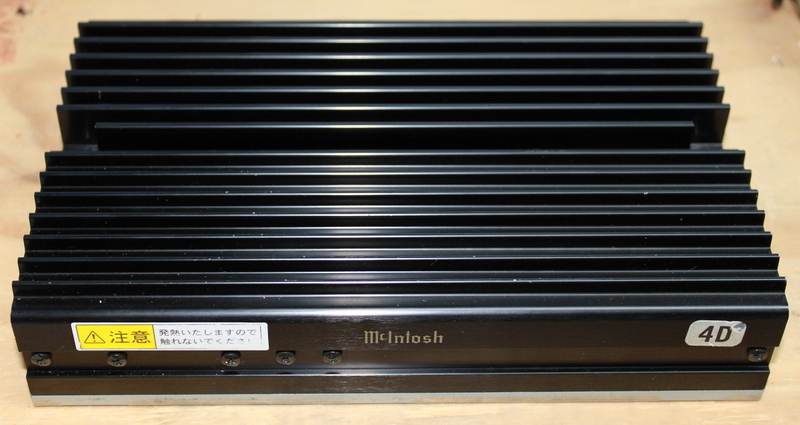 managed to get get an excellent condition Mcintosh head unit (CD & MD unit) for a really good price recently and had the entire thing installed at the loacal auto accessory shop. The system sounds really great compared to my previous setup and I’m mighty pleased with the sound quality.Very analog sounding even. The subwoofer is a bit of a letdown as you’ve mentioned and I might just have the technician swap out the resistor as you suggested. Only problem now is the the head unit keeps showing the “focus error” or “disc error” message whenever I change discs while driving.It does’ntdo so when I change discs when the engine is switched off. So I switch on the Cd player first before starting the car and then it continues playing. Changed to a new battery,added a voltage stabilizer,added a new 5 point grounding cable system and this problem persist.No such problem with the radio though. The technician can’t figure out the problem. Do you have any ideas as to how this can be problem can be solved. Would be realty glad for any suggestions from you. I had the same problem once and cleaning the lens fixed it. Having said that it could also be an alignment problem or worn laser. I’m sure you will be pleasantly surprised by the sub mod! thanks again for the prompt reply.Really appreciate it! Will try out the lens clean-out as you suggested. Failing which I’ll just have to have the unit taken out for the necessary alignment. Shame though if it turns out to be a worn laser.However, that may seem highly unlikely as it plays just fine when the engine is switched off. Yeah, and I’m looking forward to have the mod done for the sub. May try to tacle this part myself, if I can work up the courage. Will keep you posted on developments as they come along. I was just connecting my second hand McIntosh Amp in my Subaru along with the McIntosh Head unit. I misread the diagram and connected the 12V to the sub pins. I believe i have stuffed the amp in doing this. Should i try to see if it is the fuse or is it now a nice paper weight? Thanks for your informative post. To be honest I’d be surprised if this destroyed the entire amp. There are no output decoupling capacitors so this means 12v would have done directly to the sub amp chip (IC405) but these are usually pretty robust. Are all channels now dead? Am enjoying every bit of my collection of CDs while driving. Next on the the list is the resistor swap in the amp to give that sub a little help. Am just a little skittish about attempting it myself so I’ve decided to let the amp tech to have a go at it. Will report back on the results later. did the resistor swap on the power amp today and wow!!! Do call me if you’re around Kuala Lumpur.Be glad to show you around. You can email me @ james.peter736@gmail.com beforehand. I’m looking at replacing the factory HU in my RS30 very shortly. You mention that I can connect to the amp from the new HU using the + inputs only and connecting to the line of my new HU. If I buy the DIN adapter and wire my own adapter, so I can go back to factory if I sell the car, how exactly would I wire the RCA ends to the ‘+’ only inputs? I’m assuming the center pin is wired to the ‘+’ input for each channel, but what do I do with the shielded part of the cable at the DIN end? Just not connect it to anything and leave the ‘-‘ empty? eg. For front left, white RCA center pin to pin 1 of the DIN and the shield just neatly trimmed and not connected to anything at the DIN end? Also, when providing the 12V to pin 5 of the DIN, this should be the remote power from the HU, correct? What do I wire pins 6 and 12 to? Can I just ground them on to the cage the radio screws into (which I’ve been told to do in past cars, but I’m not sure if I should with this one)? You’re onto it, simply connect the centre pin of the RCA jacks to each + input. Connect the RCA shields to the DIN shield and pin 6 or 12 (doesn’t matter which). If you don’t use one of the ground pins just leave it disconnected. Make sure you leave the – inputs disconnected. The head unit remote wire goes to pin 5. Just to make double sure, you say to connect the RCA shields to the DIN shield and pin 6 or 12. So split the shield roughly into two for each lead, at the DIN end of the cable, and take one part of the shield to the large metal outer circle for the DIN, and the other part to pin 6 or 12? Also, in order to make the adapter cable, am I after the 13 pin socket, or the plug? It’s been a while since I’ve had the head unit out and I can’t remember what the connector looks like. You seem to refer to the pinout diagram being for the plug that connects to the back of the head unit, so I’m guessing I’m after the socket in order to make up the adapter cable? Thanks for your help with this, I’ve been searching for info on how I was to replace this unit without having to pull new cable or spend a heap of money, and this seems to fit the bill perfectly! You need a socket to make an adapter, but if you can’t find one buy a plug and connect it directly to the amp itself. Pins 6 and 12 are interchangeable; you can use either one or both as you please as they are connected together internally. I use both as the pins can be fiddly to solder to and I find that spreading things out makes it easier to work on. Tried this over the holidays whilst I was away, and it works quite well. Little problem – when the car is on Accessory, everything works fine, but if I turn it to On, there is a high frequency buzz across all the speakers. The person I was with, suggested that this could be because I’ve split and soldered the RCA shield onto the ground pins as well as the DIN shield. He has suggested I solder the RCA shield to just the DIN shield and a separate cable to pin 6 and 12 for the ground and ground this to the chassis. Does this sound acceptable? If not, could you perhaps explain in a little more detail how you made up your socket for the Amp, so that I can perhaps reverse the process for just using the existing DIN plug. That would work, or try connecting the RCA shield to pins 6/12 and leave the DIN shield disconnected. My car is completely stock but I’ve used these amps on the bench with other gear with no problems. Lots of good info provided here thanks! I’m having trouble replacing the McIntosh door speaker as the foam has split. Can you tell me if the foam repair kits available in the US are any good? Are they available in NZ? The foam kits from the US don’t work; I’ve already tried that! The problem is that the roll in the surround is too wide so you can’t reattach the tweeter frame. I ended up getting some low cost ($12.95/pr) 6.5″ NVS brand speakers from The Warehouse that had quite decent butyl rubber surrounds. I carefully removed the surrounds and used them to repair the McIntosh units and they fitted perfectly. They sound like new and the butyl rubber will easily outlast the original foam. Good idea, I might give it a go. What glue did you use? I’ve got a bit of left over but butyl rubber cement from roofing would that do? I used Selly’s Plastic Glue and a year later it’s still as good as new. Roofing glue doesn’t stick to the polypropylene cone very well; tried that with a different speaker once and it barely lasted a month. Couldn’t find any suitably cheap speakers to butcher for their foam. But have re foamed all four door speakers with kits from Speaker Exchange http://www.reconingspeakers.com “Refoam kit 6″ angle small RFK6” did the trick very nicely. System sounding great now, I might try your woofer mod next. You’re right the roofing glue doesn’t even want to stick to the roof for very long!!! I stumbled across you’re blog a few weeks ago and have been reading with great interest. I plan to make up a lead to connect the EF1080i to a new HU, as my Mcintosh CD/MD unit is beyond repair. Can I ask why I wouldn’t just connect the HU line output RCA’s “+ to +” and “- to -” to the amp? Hi Gary, thanks for the feedback. The McIntosh amp uses balanced inputs; – is the inverse of + and not ground. The RCA preamp outputs on most stereos are unbalanced and do not have a – signal, just + and ground. To connect an unbalanced source to a balanced input you only use the + pin and either leave the – pin disconnected or tie it to ground. Connecting the RCA ground to the – input instead of ground will mean the signal will end up grounded through the amp chassis or negative power feed and be very susceptible to noise. See this article on Wikipedia for more information. OK, so I bought the 13 pin din socket and have soldered per you diagrams above. I do get some sound, but it is very “thin” if that makes sence. There is sound out of both speakers, but it’s almost as if the majority of volume is being cancelled out. Let me know if you manage to get this to work in your vehicle, as I have tried several times to get this going in my car, and have massive problems with ground loop style noise when using the unbalanced to balanced process as described above. Mine could be caused by the fact that I’m plugging onto the end of the cable at the headunit end and not re-manufacturing the plug down at the amp, so the remote power and the audio are running side by side along the factory cable. I’d be interested to hear which way you are doing this, and if you have success. What I see is that it is fine when the ignition is at the ACC point, but as soon as I turn it to ON, the noise comes through. Start the car and accelerate and you can hear the whine through the speakers go up and down with the revs. Change back to the factory unit and everything is perfect again. I’m actually at a point where I’ll probably just replace the amp under the seat with a 4 channel one and stick a separate mono one in the boot to run a proper sub, or the superwoofer when I need the boot space. i have a 2001 Subaru Legacy with McIntosh System. The system for long time was having a lot of sound cracking and popping. Now there is completely no sound. I am wondering if it has to do with the McIntosh Amp under the seat. Is there any real way to test or fix the amp? Try the fix suggested in the article. Hi. I took out the amp from the car and found an enormous amount of rust on the bottom of the AMP. I took apart the amp and found some corrosion on two small sections of the circuit board. i am not too familiar with repairs on boards but wouldnt mind learning to see if I can fix this amp. I cleaned up the corrosion but I am not sure on how to test this to look for anything that may be shorted out.. The fuse in the AMP is not shorted out. I have to believe the corrosion has to be the reason why there is no sound in the stereo system. Any recommendations would be great.. I can supply pictures to try to help guide me. It’s highly likely that the corrosion is the cause. Somebody probably spilled a drink on the floor at some stage in its life. 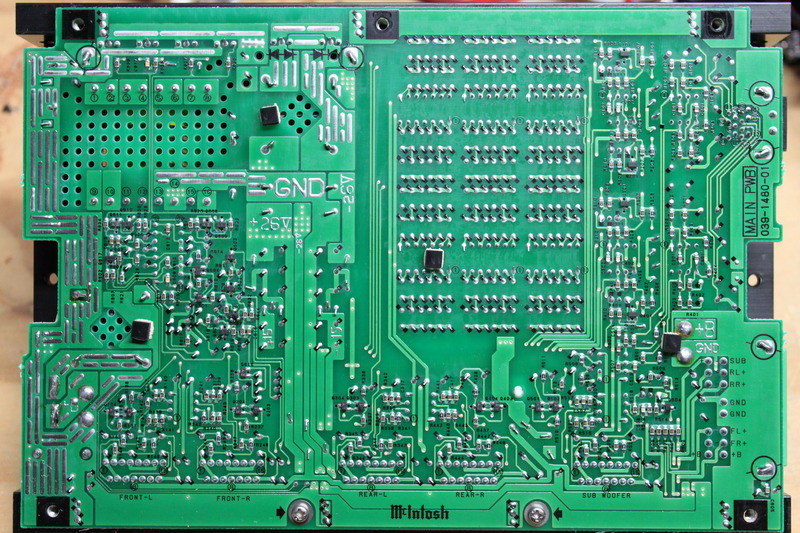 Liquids often destroy solder joints (they will be dull and crystalline) and PCB tracks. It’s a good sign that the fuse hasn’t blown. Try reworking all of the solder joints with some decent new solder and you will likely see it working again; this worked for one amp I came across. If the PCB tracks are corroded you can fix them with short lengths of wire. Just wanted to pass on my thanks for a great and informative article! I’ve just decided to add some real subs to my ’02 Blitzen which was badly bastardised by a previous owner: There’s two headunits in it at the moment, neither of which are the original one and one of which is disconnected and is just a placeholder! It still has the McIntosh amp under the seat and I was hoping I could use it to drive the front speakers while purchasing a new amp for my subs, and it sounds as though I can but it’ll be complicated!! Thanks again for the info. Much appreciated. You sure can and it would work quite well for that IMHO. This info is really great. I recently bought an imported 2000 Legacy Lancaster. It has the McIntosh MD/CD unit but on the Jap FM band. I didn’t want a band expander as I’ve had poor results in past Jap imports so the dealer put in a Sony HU as a freebee. I had no idea of the amp under the seat and believe they just byassed it. However the message centre above the HU lost power and I took it back to the dealer who said they could not run the message cente off the Sony HU as it ran through the McIntosh. They put the McIntosh back so I got the message centre going again, and a band expander which is OK in city signal strength but quickly deteriorates on the northern nmotorway in Auckland. Do you have any idea how to fit a NZ band after market HU with the amplifier and still keep the message centre going. It’s useful as it displays the climate control graphics. I’m thinking the McIntosh is well obsolete so probably not able to be replaced with NZ (US) band variant, so a newer car stereo is better for FM receptionn and I can get a unit with Aux. In for mp3 player connection. But how to marry it to the EF-108I amp as well as keep the message centre going….? Any suggestions welcomed. Replace the satnav with a regular climate unit as described in my post on the Club Sub forums at http://www.clubsub.org.nz/forum/index.php?topic=4654.0 . Buy a good aftermarket head unit with both front and rear pre-outs and wire them to the + inputs of the amp as described above. Make sure you connect the pre-out shields to ground and also ground the – inputs of the amp. Convert your McIntosh tuner to local FM band and add an aux input (both described on this site). Note you will need a McIntosh HU with a tape deck, not the MD version, in order to do that. The more I learn the more I don’t understand -:). The SatNav is what I called the message centre…? And my son showed me how to open the front of it and I note a CD slot. Exactly what is this unit – me thinking it was just a place to display workings of the car e.g. climate control, engine alarms etc. I note that in the link you provided, the mention of CeNet. What is that? I had a car radio installer take a quick look at the car and he was of like mind to you about removing the upper display unit and replacing with a standard unit as you suggested. I must confess it seems a little daunting to tackle the climate control and the surround; and clearly some research needed before pulling it out. The McIntosh is an MD/CD variant so not the cassette version your refer to for retuning. Anyway the next step before I decide to remove the unit and the McIntosh is for a better look at the type of band expander fitted and whether there is a better one than what is fitted perhaps. I believe there are two antennas and the thought was maybe only one was connected. More investigation needed. Thanks for the info so far. In the first sentence of your instructions on how to replace the climate control unit and removing the SATNAV you mentioned you had a copy of the CD for the SATNAV. I am assuming that with that CD it is possoble to change the default display on the screen, say to the climate control graphics(?). It displays a message in Jap characters. – presumably an error mesage of some kind. The reason I ask is that I have found a guy who will install an after market tuner that he can keep the SATNAV function powered up without removing it. Leaving the standard climate control function intact. He can do it for about the same price as buying the replacement climate control unit and surround parts. It seems wreckers are on to the value of the stand-alone climate controls and surround and the price was in the order of $400. If I simply had the McIntosh replaced and could leave the SATNAV displaying the climate control, that would save me the trouble of pulling the dash apart. My main aim is replacing the McIntosh with a NZ band tuner/CD/MP3 player with Aux input, not with the SATNAV. Can you supply a copy of the CD? Yeah it’s a combined GPS navigation, information system and climate display. The CD or DVD in it contains the firmware; without it the unit will just display an error in Japanese. CeNet is the interface used by Clarion/McIntosh head units to communicate with accessories such as CD changers and is also used by the satnav. There is also likely to be a factory TV tuner under one of the seats; if that is still fitted it will also interface to the satnav via CeNet. To access it press the top left hand button (next to Off) on the satnav to change it to TV; the same button that swaps between GPS and climate displays. When it goes to TV mode the HU will say AUX on the screen. If it doesn’t go to TV then yours has probably been ripped out. You can use the TV tuner to make a proper aux input if it’s there; see my climate control thread on Club Sub for a picture on how to wire it up. Japanese head units usually have two antennas for diversity reception. The main antenna connector is a standard Motorola style; the sub antenna is similar but smaller and the genders are swapped. The FM will also pass through the satnav unit for VICS reception. As we don’t have VICS in NZ, you can safely bypass it and go direct to the radio. Wire the band expander to the main antenna (it will only fit in the main antenna plugs) and leave the sub antenna directly connected. The ultimate option for the McIntosh is to try and import a PF-2520I. This is an American only version with a 6 CD changer instead of a tape or MD player. It tunes NZ frequencies natively (a minor tweak is recommended though) and is awesome; I have one in my car. Unfortunately they are very rare but worth it if you can get your hands on one. Geez you’ve obviously been there done that with this!! I’ll have to have good fossick around – always a little tentative when it comes to ripping into the dash but peering under seats I can handle. But you’ve given me some good pointers and food for thought. I’ll wait and see what this car audio guy has to tell me when he checks the band expander and antenna hook up. I’m amazed it runs the satnav with a CD in place for firmware. I see Jap characters on the screen and the buttons do nothing so I’m picking it’s an error message and no CD in place means the unit doesn’t do anything apart from the climate graphics which are probably hard wired. Thanks once again for your input. I’ll consider what you have said about the replacement aircon panel. I see Partsworld are listing a few so might call and make inquiries about that and the surround. My Lancaster has the faux woodgrain plastic surround. A very interesting thread. I own a BH5 (wagon) GTB E-Tune 2001. I imported the car myself from Japan to Australia about six years ago, after being the second owner in Japan. Factory spec was a McIntosh 2-din CD/MD head deck (HD) setup. Unfortunately, about six months ago the car was broken into and someone stole the head deck. Its an insurance claim, with Subaru replacing the original HD with an original McIntosh CD/cassette setup with Australian FM band. I wanted to keep the car original. All good? Well not quite, I have no right channel at volume. Also, I’ve found someone in Australia who is pulling out their original HD and amp and yes, the din cable. I’m pushing Subaru to fork out the money for the used package. All good? Maybe, provided the problem with the right channel is resolved by the second hand din cable. Otherwise I’ll push Subaru to get an auto electrician repair the din cable as outlined in this thread. I don’t like their attitude; insurance is supposed to male sure the car is restored to its previous working order. I agree that the cable would be a pain to repair; it would be.much easier to replace it. Replacinging it requires taking the drivers seat out so its a little bit of work but not too bad. Any good Subaru dismantlers will have a good one available for a reasonable price. In NZ I often deal with Rosco in Ashburton and they normally have them available for about NZ$35. As stated above its pretty simple to make one from scratch too which also might be worth a shot. If you get nowhere I’d suggest doing it yourself. Nice that they gave you an Aus replacement though, they are worth far more to buy than the MD unit as they are much harder to obtain. Nzlamb, I don’t like their attitude either. Its frustrating that I have to do all the work. The replacement HD is brand new and according to Subaru (quote to the insurers) its AUD4500!! I’ve told Subaru I don’t care if the required replacement DIN cable is second hand, hence it looks like they’ll pay for one from a guy in Queensland. Just need it to work. Once we get the cable, over to Subaru to replace it, and all that’s involved – ie, removing the seat (which is electric). Its a great car, but do to a couple of changes in my life I need to move it on. Hence the desire to get it back to what is (over here in Oz) a rare example of a BH5. Nzlamb do you have a copy of the DVD for the McIntosh unit? I would like to change the default view to climate control if possible. I own two 2002 Subaru Outback SW VDC models, both of which have the McIntosh factory audio systems. The green one has 240,000 miles and the McIntosh performs perfectly. The red one has 90,000 miles and recently the audio system went completely dead. One second it was performing fine and the next completely dead. I checked all the fuses. Apparently there are three….a 30 amp under the hood, a 20 amp under the dashboard, and a 25 amp on the amp’s PCB. They all look fine visably but I haven’t checked them with a multimeter for continuity yet. I downloaded the Clarion service manual for the amp off the internet. The head unit seems to be functioning fine. I guess I could narrow the problem down by taking the amp from the green Soob and hooking it up to the cables in the red car. If the system works good then I know the original amp is the problem and go from there. Thanks for an informative blog. Is it possible to get a copy of the amp service manual off you so I can post it here to help others? All the fuses are fine. There’s 12V getting to the amp but when I measured the 26V and 15V power supply rails there was zero volts! Backing up to the power supply transformer there is 12V on the primaries but zero on the secondaries. Looks like the transformer (T-601 on the schematic) might be shot. Wonder if I can get another one from Clarion? I’ll have to check on whether I can put the manual on the internet. I may have agreed not to when I bought it from the internet download source. There isn’t much in the way of troubleshooting tips in the manual I received. It has some specs, a block diagram, exploded view parts diagram, detailed parts lists, two large schematics, and a large PCB layout diagram. The schematics do have normal operation voltages for a lot of the circuits. To be honest I’d be surprised if it’s the transformer that’s failed; I’d concentrate on checking the driver transistors and rectifier diodes around the supply to begin with. The 15v rails are derived from the 26v rails so once you get the latter going it should all begin to work. The EF-1080I PSU stage is a relatively standard design based around the common TL494 (or a clone) as found in many computer PSUs. I have a scrapped amp lying about with a working PSU stage so if it is the transformer I could send you a replacement if you need it. No worries on the manual either, I didn’t realise you had paid for it! 🙂 The circuit diagrams are still very useful for troubleshooting though. Yeah, I think you’re right about the transformer. It looks to be in perfect shape. In any event Clarion’s part supplier in the US is checking availabilty. Since I have two cars with the McIntosh audio systems I might go ahead and spring for a spare, new amp from Subaru. That way I’ll always have a backup and it will give me more time to troubleshoot and repair this one. Used EF-1080I amps for sale are pretty rare as the McIntosh audio system was only installed in Subaru’s top of the line Outback VDC model in North America for a few years. I drive long distances and good music is a must. Let me know your email and I will forward the manual. It’s a zip file of about 2.5 MB. I found that it works good to print each of the schematics as a landscape poster on four sheets of 8.5 x 11 paper, then tape them together. Thanks for the tips and the very generous offer of the spare part!! Does anyone have the DVD/CD firmware disk for the McIntosh? Correction to my previous submission…does anyone have the DVD/CD firmware for the SATNAV…! my mcintosh suddenly has no sound coming out of the speakers in my subaru 1998 gt wagon, i removed the head unit and installed a jvc head unit, once the jvc connected there is sound on both radio and cd but only for a few seconds, and i only have sound in the two back door speakers once all wires are rejoined, there is a buzzing in the front door speakers and the sub in the boot. Is there a problem with the (mcintosh) amplifier under the drivers seat??? First off, thank you for this site – it’s extremely helpful! I’ve tried the RCA (+) to the (+) inputs of the McIntosh DIN cable, and the RCA shields to the (-) inputs of the DIN cable. This configuration seemed to be the quietest, but it was still not usable. since then, I’ve tried connecting both the DIN and RCA shields, with the DIN (-)’s disconnected, and that was very noisy. I’ve also tried connecting both shields directly to the headunit ground, and it was also extremely noisy. And lastly I’ve tried both the RCA shields to headunit ground, and it was also extremely noisy. Other comments talk about connecting to the #6 and 12 pins as a ground – but my DIN cable doesn’t have wires to it, as it’s internally wired to the DIN ground. At this point I’m very confused because connecting the RCA shield to DIN (-) shouldn’t work, but that was the quietest so far. Oh, and this question is about a North American Market, 2003 Outback VDC Wagon. I’vi just finished installing an aftermarket head unit in front of one of these amps in my BE5 legacy and wanted to point out how I got around the ground loop (alternator whine) issues that a lot of people seem to have. The factory Mcintosh HU was pretty reasonable sounding but was jap frequency radio, no mp3 playback, and no usb (not surprising given its form 1999), so I decided to swap it out for a new alpine CDA-117E. BIG SCARY WARNING: do not just connect your flash new head unit up to the wiring harness behind the stereo. Unless you disconnect BOTH cables from the amp under the drivers seat (RHD model) it will short out your outputs and blow the high level outputs on your head unit after about 10 seconds of a loud buzzing noise coming through the speakers along with your music! The service manual says the HU > speaker wiring isnt connected to anything, but its wrong, at least it was for me. So with that very expensive mistake made, I was stuck using an amp of some sort. I looked at an aftermarket one but decided to give it a shot with the existing Mc amp first. In the spirit of my changes being reversible, I ordered a 13pin bit plug off ebay for ~$13. This was marketed as a light wiring connector and had both male and female din sockets attached to about half a meter of wire each. My plan was to use the female socket and wire it into 2x pairs of rca leads that I cut in half and could be connected straight to the HU. This would all sit in behind the HU and connect to the factory DIN cable. center pin of each of the 4x rca’s goes to FL+, FR+, RL+, RR+, amp remote goes to the amp output trigger from the HU, and I joined all 4 RCA shields together, and connected this to both ground pins (6+12), as well as every channels negative output. ie nothing goes from the DIN socket directly to ground, everything negative or ground all joins to one cable that attaches to all 4 RCA shield wires. The last remaining issue I had was that the plug I had ordered had only 12 wires connected to the 13 pins, and pin 13 didnt go anywhere. This meant that the back right speaker still had ground noise coming from it. To resolve this, I stripped the coating off about 12mm of very thin tweeter wiring, and with a couple small screwdrivers fed one end of it into the hole for pin 10, and a few strands of wire down the edges of the pin 13 hole where the male din plug in the car would press against it. This essentially “moved” the pin13 RR- to pin 10, where I had a usable connecting wire. I then added the wire for pin 10 into my massive ground/neg wiring bundle and everything now works brilliantly. This helped. I still get a faint whine when the engine is running, but not as bad as it was before. I was thinking about running the (-) DIN connections to the RCA shields. I also thought about just running each separate, as in not all bundled together, as you’ve done. Mine’s a 2001 US model VDC with the McIntosh system. It’s getting late here, so I’ll have to finish it up tomorrow when I get back into town. I have the PF-21421 and under seat amp set up and I want to install a Sony HU that I’ve just bought which doesn’t have RCA outputs – just a standard harness with the +- output for FR, FL, RR, RL, Power, acc power, gnd and a power antenna output. The McIntosh HU has the rectagular 14pin harness and the 13pin DIN plug which goes to the amp as well as the 2 male and female connectors for the antenna(?). I know I might be repeating questions asked already but if I connect the DIN lead up as suggested above, what do I do with the 14pin harness? If anone has a wiring diagramme that would be super helpful. I’ve been hunting all morning and can’t figure this out – probably a serious noob question but any help would be appreciated! Do you know where in Auckland or in the country I can get the components for the repair job that you’ve talked about? Or otherwise do you know where I could buy another one of these amps to replcae mine. I’ve searched everywhere and can’t seem to find much. Any help you have is greatly appreciated. Element14 sells the parts and usually deliver overnight. Regarding the amp, just search Trade Me. They don’t come up often but when they do they usually go cheap. I am having a very hard time understanding how I am going to be able to connect my Pioneer 4800MP into my 2003 Subaru OBW VDC. I already took out the McIntosh HU, now i’m perplexed. I am about to buy the 14 pin wiring harness, but even with much reading I can not understand how the 8 pin “subwoofer” output and the round 13-pin “pig-tail” output will all connect into the amp under the seat. I’ve read that 8 of the speaker outputs from the 14-pin outputs are n/c, so does this mean instead they come from the 13- pin pig-tail one? I would really appreciate any help on this, I keep reading SVXdc’s posts to get more understanding but all i can get is that I’m going to have to create a harness that splices into the RCA cables for the Pioneer HU (which seems to give many people a “alternator whine”. So, I’ve already made a custom harness to use my JVC stereo with the McIntosh amp. It works well, but I still get a little (not much at all) alternator whine. I ended up replacing all door speakers, since the front two were blown when I bought it. The amp seems to be holding up ok with the 4 ohm speakers (can’t find 8 ohm replacements, period). I had a brainstorm that I tried to put into action the other day, but the end result was bad… real bad. My idea was: get another Subaru wiring harness (Metra 70-8901) (it mates up to the harness that plugs into the amp perfectly, minus one power wire that’s absent), wire up the speakers from the head unit to the harness using speaker wire according to the pinout for the McIntosh amp shown above, effectively removing the amp altogether. At first, it worked. The volume seemed a little weak, so I tried to push it. I ended up with a warning across the screen of the JVC saying to check the wiring and reset the stereo. I did so several times. I can’t find a problem. I noticed the dash harness has wires in all pins, which isn’t used with the McIntosh stereo (for speaker output). Are these live wires? Do they go to the speakers? If so, do I have to do anything with harness that plugs into the amp under the seat? Next up: where is a good place to run the power wire for an aftermarket amp? I can’t see anywhere that there’s a grommet passing through behind the pedals, thanks to that extra thick rubberized sound deadening material there. I won’t start drilling holes in “the dark”… ain’t gonna happen. My plan was to place the aftermarket amp under the passenger’s seat, then use my wiring harness theory to feed power back to the stock 6×9 (will be upgraded), but now I’m not sure. You could use that harness to push sound directly to the speakers via the old amp connector, just be aware that the pinout is very different so you would need to wire it as shown above rather than using the colour codes on the harness itself. Also, don’t use the power or ground pins on that connector for the speakers. That said, there’s no reason why you couldn’t use that entire connector for an aftermarket amp, including the power supply. Be an easy way to fit in place of the factory amp with minimal wiring mods required. NZLamb, Thanks for keeping this page up to date. I have successfully fixed a dead (silent output) EF-1080i in the past as a result of this thread, however now i am faced with another problem with my new car (bugger!). My Gen4 Spec B Liberty McIntosh Amp has failed. The problem i think lies in the power circuit as the B+ and GND are shorted out with each other, which causes the fuse in the engine compartment to blow when the amp is plugged in. Opening up the amp, there doesn’t seem to be anything out of the ordinary, and there is no “leaked” caps or obvious blow outs. Do you have the service manual for your amp?, It would be a delight to be able to probe around knowing what should be shorted, and what shouldn’t be. Anyway, any help you could provide or what to look for would be awesome! I’ve just bought the Service Manual for my Amp, so will dig into that a little. It is near identical to your amp, so if you want a copy, shoot me your email address so you can load it up on your page. I have a Subaru Legacy SPortswagon B4 Spec B with a McIntosh EF-12081 amp system. 11 speakers. 4 in each front door and 1 in each back door + subwoofer in the boot. All the door speakers are 8 ohm but can only get 4 ohm here in Barbados. Can I use these without a problem? Also, i would also like the service manual for your amp if it is similar to the forementioned unit. Thank you in advance. I’ve purchased a cheap aftermarket head unit on ebay so that we can do bluetooth phone calls and also music streaming on our MY02 Liberty B4 (macintosh head unit and under seat amp). What i’m reading is, that while you can buy a 13 socket din connector and wire in the unbalanced RCA outputs from an aftermarket head unit to feed into the amp,and ground the lines, no matter which way you swing it, you’re going to get some noise through the speakers? The wiring option from CJ on the 9th July last year seems like the least noise creating solution, however there is still some noise from what he’s saying. I guess i’m now wondering if a head unit replacement is even possible while retaining decent sound/signals. I want to be able to get my car back to stock again when i sell it, so a full system rewire is not really what i’m looking for. To be honest, in your situation I’d probably recommend one of the Anycar adapters. I put a Clarion-compatible Bluetooth version on my factory McIntosh HU and it works really well. They are all over TradeMe but I’m not sure where you can buy them in Australia. Thanks for the quick feedback, much appreciated. Yeah, guess i’ll just sell the Chinese one i got and try to recoup whatever i can from it, then get an adapter for the music streaming, and use the hands-free option on my phone rather than have it run through the stereo. How do i wire an anycar style adapter into the stock head unit? there’s a square looking plug in the back of the Macintosh unit that’s not in use, is that it? ah, there’s a blog post on your site on it.. sry. Did the sub boost….sweet! 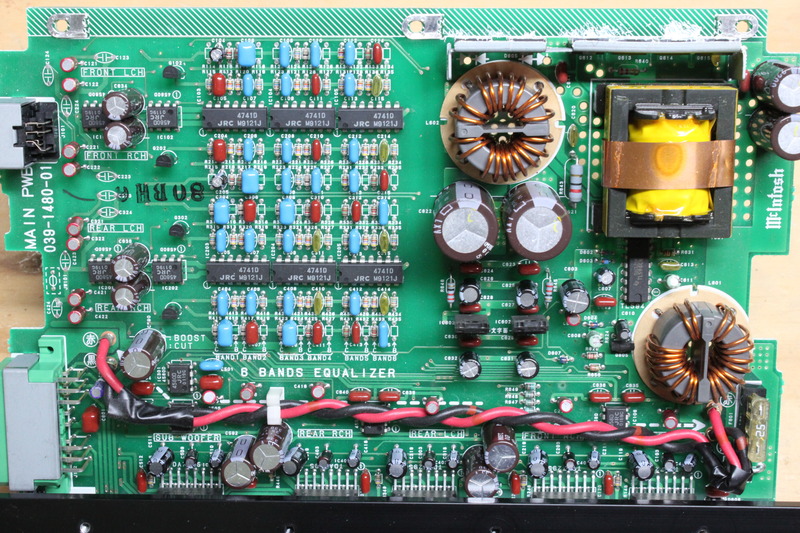 used a slightly high value 46.2k resistor my systems sounds totally different….thanx man! i have a HU but no amp and want to refit 01LLbean wagon to McIntosh. emailed info would be greatly appreciated. The HU will be a drop-in replacement if the factory wiring is still intact, except for the speakers. You will need to supply an amp of some sort (even if it’s not a McIntosh one) and re-route the speaker wiring to it. In JDM vehicles there’s a suitable ground point under the RH front seat and you can take power from the dedicated, fused high-current feed intended for the McIntosh amp. This normally exists even if you don’t have the McIntosh as a factory option; look for a fuse marked ‘Amplifier’ in the fusebox under the dash (you will need to remove the kick panel to get to it). The connector is a large four pin connector under the dash facing down; look for a spare terminal and measure the pins while pulling the fuse to see which one to hook to. Thanks, this helps. Which is easier, Mc amp or replacement amp? Got sugestions for suitable or better fit amps? What about under seat sub & 6 disc under stock HU? What is VDC switch under HU for? Lots of ?s, sorry, starting from scratch here, hardly any help or info around. Thanks again, Rich. Hi NZLamb – this is good info re: the amp wiring, I was just looking at doing something like this to replace the McIntosh amp in my vehicle. A question regarding the wiring – I’m looking at a fairly low powered amp, a 350W Alpine Mono (this one actually: http://www.crutchfield.com/S-wt4oCn8KGOg/p_500MRPM350/Alpine-MRP-M350.html). I see it recommends that I should use 8 gauge wiring for the power and ground feeds, I don’t suppose you happen to know what gauge wiring is there for the amp power feed in the factory install, or if it would be enough to successfully and safely drive this amp. The idea will be to use it to power a sub the majority of the time, but when I require the boot space, I’ll probably just hook it back up to the McIntosh superwoofer in the parcel tray. I’ll be looking to use as much factory wiring as possible, I want to be able to refit the factory setup when I sell the car (so far I’ve easily managed to achieve this). Hi. I am replacing the HU of a 2002 Subaru Legacy with a newer unit with Bluetooth. After wiring the harness to the 13 pin mini din connector to the preamp, the preamp has a noticeable whine when on. The audio channels seem to work OK, but was wondering what might cause this. The only thing different from standard would be non twisted pairs for the inputs and the din shroud does not connect to anything on the new harness. I removed it because it would not let the original connector seat properly. Any thoughts would help. Thanks. this is a fantastic blog with heaps of info, keep up the good work. I have a question, if i was to connect a powered external subwoofer would i connect it to the subwoofer output of the amplifier through a speaker to line level converter or to the rear speakers through a line level converter? I’d do it to the rears so you can bypass the low pass filter and use the one in the new sub. It will give you a little more control over the sound. Great! Thanks for your advice. I had done that in my last car, but didn’t even think about it in this one. I’m probably going to install some of the subwoofer stuff either today or tomorrow. Any tips on running power and ground in this car? I’m trying to keep records of my work on it’s own blog for the North American owners, since the cars may differ just slightly. The URL is in the reply info. What amp should I use 2 replace the McIntosh amp 98 Subaru? Hi, I have this setup in my subaru outback. Has performed very well until recently. It has started loud crackling and popping no matter what volume the head unit is set at. I thought it could be loose connections and am having a look this afternoon. Found this site as a great resource and would be glad for any pointers you may have and if you have heard of this problem before. I assume this is in all speakers? I’d first try hooking a different amp to the output of the head unit (see the pinout above – ignore the negative (cold) outputs) and see if you still experience it to help isolate the cause to the amp itself. Check that none of the amp connections are loose too. If it’s the amp it’s probably either the muting circuit or the power supply section. I’d also suggest replacing the muting transistor as it seems to be a weak point in these amps. It could even be on its way out and causing the problem in the first place. I’ve got an article on this for more information. Hey there, just wanted to drop a thanks for supplying this information! I’ve got a 2007 Legacy (based in Tauranga) where the headunit has failed, so am putting in a new headunit and amp (wanted a new amp anyways) and the wiring info for this is really, really handy! So just a big thanks for posting this, and continuing to answer questions! Was wanting to install this entire system into a Suzuki XL-7 for no other reason than wanting a McIntosh system in the car. Outside of the difficult to find connectors, is there any other problem that I would have assuming that my skills in correctly hooking up the power and speakers won’t fail me? No problems anticipated, it should wire into any car quite easily provided you have the correct plugs. The plugs themselves can usually be obtained very cheap from most wrecking yards. If you can’t find an amp one just buy two head unit plugs as they are the same anyway – just make sure you get the wiring correct on each one as the head unit and amp and different pinouts. OK…I have acquired a PF-23431 Clarion.McINtosh system with the matching McIntosh power amp. My current system in my car is also a CLARION system (2001 Suzuki XL-7) and it has the exact same power/speaker input connector as the McIntosh made unit. Obviously, the speakers outputs on this connector need to be bypassed BUT in your experience, does Clarion use the same pin in/out layout on all their stereo systems….would things like power, ground and illumination all be the same on my current system? I understand you may not be able to answer this question I just thought if you have a lot of experience with Clarion, you may have good advice. THANKS! Ahh…I think I just answered my own question. Going through a few different Clarion schematics now and all are very different. No problem. I’ll get her right. I have an import 2000 Subaru Lancaster wagon with the McIntosh head unit and amp described in this blog. I have a rattling LH front door speaker (distorts/rattles on low-medium volume). What is a typical replacement? Wattage, impedance and size (circular, or elliptical and depth of magnet). They are 6.5″ coaxial drivers and are 8 ohm. Any 6.5″ door speaker should fit as a replacement, just make sure you replace the front speakers as a pair otherwise the impedance mismatch will result in the replacement sounding louder than the other side. The other option is to simply replace the rotten surround in the existing driver – I did this to my car and it cost around NZ$40 all up including glue. I’ve got some photos of the process in case you are interested. Yes it sounds like a mechanical rattle not an in-audio sound. I’d appreciate the photos, as you say it might just be the cone not the diaphragm. Better to be forewarned before pulling the door cover off. Thanks for your prompt reply. The OEM McIntosh coax speakers in both of my 2002 VDCs are going bad due to rotten foam surrounds. I have them redone at Jamac in Portland, Oregon for about $30 each. Ron at Jamac is extremely good at what he does. They have been in the speaker repair business since the 1950’s. Installing a new headunit and how do I connect the amp to the stereo. I’m using all factory harness but I’ve noticed I have one plug and I don’t know where it goes to the headunit it’s a round plug with like an “L” shaped group of pins. I’m putting in a Sony Xav-65 any help ASAP would be great! That’s the plug described above. Follow that pinout and hook it to the pre-amp outputs on the stereo. Don’t connect the speaker outputs to the McIntosh amp unless you use a proper level attenuator. If that’s too difficult then you will need to take the amp out entirely and run your own speaker cables to the dash from under the seat. nzlamb can you help? I just got my gtb with the mcintosh stereo, the speakers where buggered, i have the subaru nav/climate system so i dont want to replace the headunit. Im in the middle of replacing them with some 4ohm kicker coaxial and just hooked up the driver side to test and its sounds terrible very distorted and muffled, would you know why? do i need the passenger hooked up as well? is it because its a coaxial speaker? It sounds more like a fault somewhere else in the system to be honest. The original speakers are coaxial too but this shouldn’t have any bearing on a muffled or distorted output. The best way to check would be to hook the output of the HU to another amp or feed another signal into the Mac amp to try and isolate the fault to the amp or head unit. Another possibility is a somewhat common failure in these amps detailed here. If you have to wind the volume right up to get any sound out of it at all then this might be worth investigating. Does anyone have any idea what the acceptable voltage levels INTO the amplifier would be? Or what the line level voltages out of the head unit are? Hi there Have read through all of the above and have a 2004 legacy with the full sub and amp setup. There is a massive whine that come on when the car is started and goes away after 5mins. The auto electrician tried to supressors etc but could not resolved this. He thought it was coming after the amp….any ideas much appreciated. Has the system been modified at all? If not then it sounds more likely to be in the amp. Adding suppressors is unlikely to fix it if it is a fault that has occurred by itself. I’d recommend checking the PSU stage of the amp in particular, especially the state of the electrolytics and for any dry joints. this may sound like a silly question, but the 13 pin DIN diagram, is this looking at the front of the plug with the original cable pointing away from you? Great Read! How does one find the 20 pin version used on the newer models? There are several versions of the 20 pin model. I’ll see what I can track down but there is a bit of information around the web already. Really great post and blog in general. Does anyone have any info on the PF-2142I ? I am looking for info on the outputs to see see if it has speaker level outputs. Appreciate any help guys. How can I bypass the 6 band equalizer? Hi. I want to thank you for information from this blog. You’ve done amazing job. I have only one question. How did you connected the amp to the battery? I mean, i’ve seen output connector diagram, but did you made direct wire to the battery or did you use some existing wiring from the car? I connected it by running a new cable from under the seat to the connector behind the dashboard. There’s a four-pin power connector in the dash board that connects from the dash to the body wiring loom (check the service manual for the car). One of the pins in this is dedicated to the McIntosh amp and many models have this connected as far as the dashboard including the fuse, even if they didn’t come with the McIntosh setup. If there is an amplifier fuse fitted in the fuseboard already then that’s the case for your car. When you find that connector you can simply push a standard spade lug into the fourth (empty) pin by reaching up under the dashboard. On RHD drive cars it’s against the far right corner up under the dash beneath the A pillar – you can see it if you get a torch and shine it up under the dashboard with your head in the footwell. You then run a cable form this to the amp under the seat – the only thing you need to remove to run this is the kick panel trim along the bottom of the door and the driver’s seat (RHD). Hi nzlamb, I really appreciate your experience with McIntosh equipment. I really impressed your attitude into it. Last weekend I supported by friend in McIntosh PF-2142I installation (HU, AMP, CDC). Could you please share your experience? Generally speaking installation went successfully, HU and AMP are working on standard speakers. It sounds much better than standard audio system. We couldn’t run the CDC, is there any secret key combination to run it, or maybe is it broken? We put CD into CDC but we cannot control it from HU. If it is broken, can it be replaced by any other Clarion CeNET CDC? We run McIntosh on standard speakres, they must be replaced (suspension is out). We have only McIntosh woofers. What can give us better sound quality? Hey there, got a question. When using a non McHU with the McAmp, would something like this be effective at resolving the connection between a unbalanced line out and the balanced line in? I have pulled the amplifier apart and checked the fuse and it’s still good. I love your blog! Thanks for all of the useful information you have managed to glean and post over the years. I have at least one speaker (front passenger) in my early 2000s H6 VDC that has had the foam deteriorate. What I’m thinking of doing is removing the two front speakers, sending them off to get the foam surrounds replaced, moving the rear ones up to the front, using it with only 2 speakers for a while, then sending the other 2 back to get them re-foam’d after the first 2 come back. Is there any risk with this particular amp of running any of the channels with no load attached to them? Or would it be best for me to attach some dummy loads to the rears while I wait for the speakers to be serviced? Running it without a load for a while won’t hurt. I should get some pictures of the BP setup. It’s fundamentally similar. The easiest/cheapest way to get a good repair if you are happy with the sound of it is to buy a re-foam kit and fix the existing speakers. Takes a couple of hours work and way cheaper than finding original replacements, especially now they are of the age when replacements are often already suffering similar levels of rot. Sorry to comment on an old Post but I was wondering if you happened to know about the head unit itself. I picked one up and will be attempting to cobble it into my old Toyota Previa. Do you know if the head unit requires the amp to work? Or can it power speakers on its own? Given that it’s an old van I’m not driving any high end speakers, just getting hard to find a decent CD/tape deck these days that doesn’t look horrendous. The HU needs an external power amp to work at all – there’s no amplifier built-in. You can connect it to any brand of amp if you have the plug, or you can cut the plug off and attach directly to the cables.